Premium tyre brand Apollo Vredestein is seeing increased fleet take-up as a result of a move to drive up its corporate business in 2017. A key focus has been on establishing new fleet partnerships through the dealer network while the company’s recent entry into the OE sector through partnerships with Seat, VW and Ford has also strengthened its position. 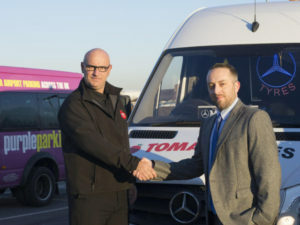 Recent deals include with refrigeration servicing company Michael Ward, which runs 50 vans, three store vans and six company cars, as it switches to an all season tyre policy, while independent garage 2U Tyres, which has been dealing with Vredestein for 14 years, is using Vredestein for fleet fitments. Purple Parking has also switched to to Vredestein and Apollo tyres for its fleet of vans and trailers, and says it’s seen a resultant substantial reduction in wear, up to three or four times less than previously.